Discussion in 'Guides' started by RGiskardR, Aug 9, 2018. Most Windows users who run the email client Thunderbird run 32-bit versions of the client. How I know that? Simple: the only version offered on the official Thunderbird download website is 32-bit for Windows. 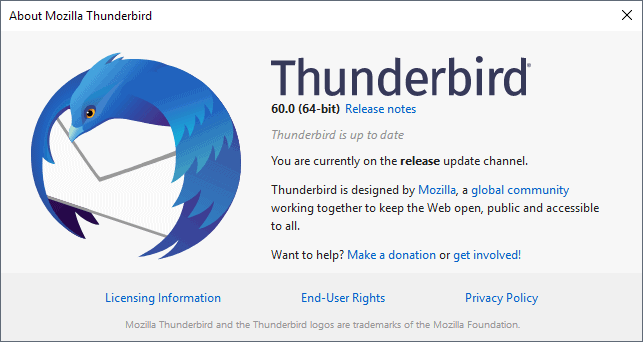 While it is possible to grab the 64-bit version, users have to actively search for it to download it as there is virtually no reference on the official Thunderbird website that indicates that such a version exists. When you open the "all" download page on the Thunderbird website, you will notice that only Linux users get to choose between 32-bit and 64-bit applications. Mac users get the 64-bit version of Thunderbird automatically, and Windows users get the 32-bit version of Thunderbird.